A lot of patients come to me seeking help in trying to resolve root canal infections. The problem is that the basic protocol for treating root canals hasn’t changed in the last 30 years, ever since I got out of dental school. There have been improvements and tweaks, but we are still using the same basic approach, strategies and tools. What is a root canal and how is it done? 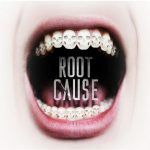 What’s the problem in doing root canals? You remove the nerve and blood supply of the tooth, thereby removing the natural healing capability of your tooth. Too much tooth structure might be removed through over-instrumenting and using posts (See above video). Using the wrong rinses during the root canal procedure can cause denaturing, alteration and weakening of the remaining tooth structure. 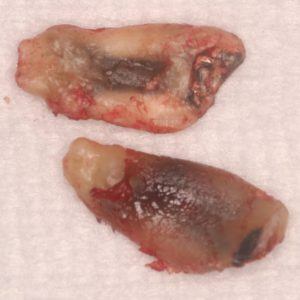 The sealers used to fill the canals and plug up the tooth are sometimes inflammatory to the bone surrounding the tooth. Bacteria is left behind that can eventually reinfect the tooth and bone around the tooth. Keep in mind that dentists are trying to save your tooth when they recommend a root canal to you, and it takes a lot of skill and training to do a root canal. A whole specialty called endodontics is dedicated to doing root canals using the best materials and procedures known, as evidenced by research. However, there are problems when you weaken the structure of the tooth and remove its nerve and blood supply. It’s not the practitioners’ fault, as they are doing the best they can under very compromising circumstances. 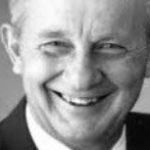 However, these problems still exist, as they are problems inherent in the procedure itself. This results in a lot of these teeth failing over time. Wait a minute, I thought root canal treatment lasted forever. Are you telling me it’s going to fail? In my practice I see many failing root canals due to infection. After root canal therapy, the tooth no longer has a blood or lymph supply to bring immune cells into the tooth or carry waste out of the tooth. This makes it impossible for the body to fight the bacteria present in and around the tooth. Without the protection provided by the immune system, the bacteria that originally infected the tooth remain – although at reduced levels – and can slowly re-infect the tooth. Here is an example of what can happen with root canal therapy. The image to the right is an Xray of an old root canal that has gotten infected. See the dark area at the end of the root? 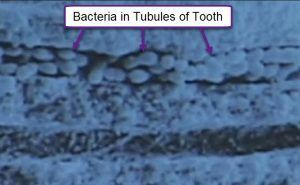 Bacteria draining from the small hole at the end of the root into the bone around the tooth. The picture to the left shows the same tooth after the patient decided to extract the tooth and get rid of the infected root canal. 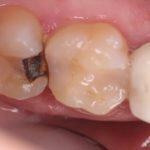 As you can see the roots are stained black due to infection in and around the root canal filling. This results in toxic material and bacteria soaking into the body of the tooth itself. Eventually this toxicity and bacteria will leak into the bone around the tooth causing inflammation and tissue damage. More on this below. Doc, how can a root canal fail so badly? 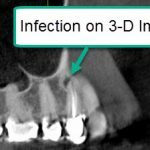 The goal of doing the root canal treatment is to reduce the amounts of the bacteria to such a low level that the patients pain resolves and the area heals as evidenced on Xrays. 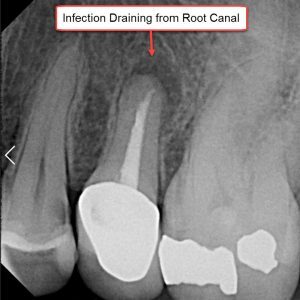 In voids within the canals themselves as these canals are are irregularly shapedOne of the prime problems with root canals and why they fail later is that the practitioner cannot reach all the bacteria or is therefore ineffective in killing them. What are Dentinal Tubules and why do they matter? Dentinal Tubules are communication channels between the pulpal tissue, i.e. the blood and lymph vessels inside the canals of the tooth and the ligament and bone outside the tooth. These channels transmit not only feeling to the nerve of the tooth but nutrition and immune cells from the pulp tissue into the hard structures of the tooth (the dentin and enamel) to keep it healthy and strong. More and more research is coming out showing the importance of the tubules in keeping the tooth vital and healthy. What happens to the tubules when a tooth gets infected? 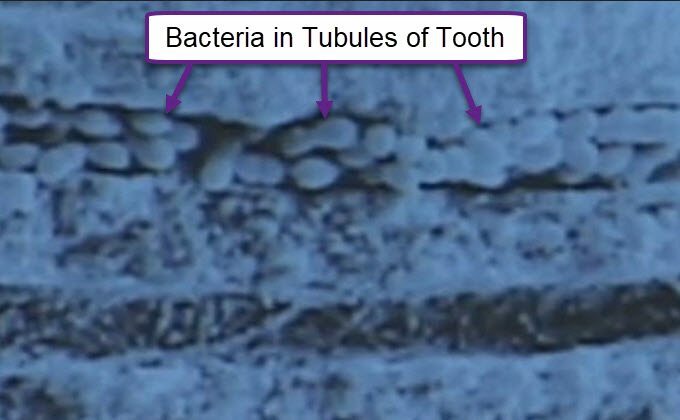 When the tooth ‘dies’, the pulpal tissue necroses (undergoes tissue death) through bacterial invasion. The most common cause of this is from decay or a deep cavity, When the bacteria invades and overruns the soft tissue in the canals, the tooth becomes diseased and infected. It is now a sick tooth and needs treatment. Before the tooth became infected the tubules were filled with nutrients, minerals and even immune cells. After the infection the tubules become filled with bacteria, bacteria waste products called endotoxins, and other inflammatory materials and byproducts of anaerobic metabolism now prevalent in the tooth. 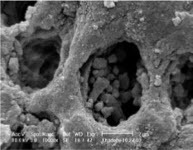 Here are images under an electron microscope showing the bacteria now populating the tubules of the roots of a tooth after it has become infected. It has been estimated that there is over a mile of tubules in one tooth if those tubules are laid side by side. 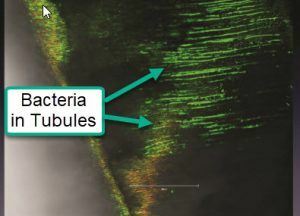 That is a lot of tubules and potential bacteria that can be left behind even if all the bacteria inside the canals is removed or killed which, by the way, is almost impossible to achieve. even after the root canal is finished? Yes. I’m sorry to have to tell you this. However, bacteria are very good at surviving. Bacteria will create an oily ooze called a ‘biofilm’ that they can use to hide from most antibiotics, medicaments, and drugs. 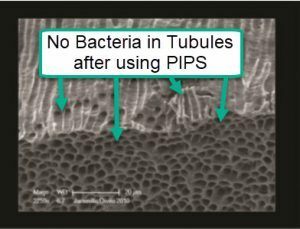 There is also what is called a smear layer which is debris that plugs up the tubules and further insulates the bacteria. Unless this biofilm and smear layer are penetrated and broken down, the bacteria will remain and persist. The way that dentists break down the smear layer is with EDTA. Then the dentist can use rinses like Bleach and Chlohexidine to kill the bacteria in the canals of the tooth and in the biofilm. Wait a minute, did you say bleach is used during root canal therapy? Yes. Up till now, bleach has been shown to be the best solution available to kill bacteria and break down biofilm. 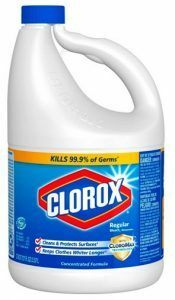 Bleach is Sodium Hypochlorite (NaClO), and the bleach used in dentistry is common household Clorox. Most practitioners dilute this, however even when diluted, it can denature the tooth structure and weaken it. The other problem of course is that if any bleach leaks or is pushed into the bone around the tooth, it is very caustic and can cause tissue damage. Believe me when I say that bleach is not good for you or for the bone and tissues around your tooth and can create problems. 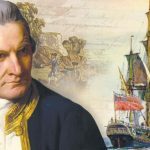 More on this in another article. The good news is that there is a protocol and solution that’s been made available that does not use bleach to kill bacteria during root canal therapy. More on this exciting breakthrough below. OK, back to the problem of residual bacteria? 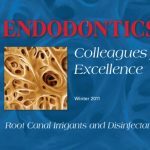 The problem with residual bacteria around root canals is that they release endotoxins. Endotoxins are basically poison to the body and stimulate an immune response to remove them and heal the cell death resulting form them. 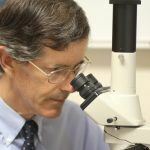 The way the body cleans out damaging and toxic material is through the release of cytokines into the area, which are inflammatory proteins that bring healing cofactors, activate stem cells and increase blood and lymph flow into the area. It is how the body heals. Activation of the immune system is how the body mounts this healing response. Everyone has experienced the inflammation caused during the flu or a cold. It is not a pleasant experience, but it is only temporary and then the body recovers. So inflammation is necessary to heal any injury or infection. On a short term basis it is fine. However, if inflammation remains for an extended period of time it is not good or healthy. Inflammation has been called the ‘Silent Killer.’ This is the kind of inflammation that is chronic and remains in your body long term. This could be an inflammatory condition like an autoimmune disease, long term stress, or an infection that is never fully resolved or healed. A root canal can be considered to be a source of such a long term inflammation, as the bacteria associated with it continue to release endotoxins into your body. This is the long term inflammation we are talking about that creates an immune response and cytokine release that is low grade but continual. All this doesn’t sound good, doc. Do I want a root canal at all? This is a good question. Root canals are a definite compromise and have some inherent problems. However, it is the only way of saving your tooth once it becomes infected. The other option of course is to extract the tooth, but this is not a good option either if the tooth is not replaced, as it creates bite collapse. What I find in my practice even after informing my patients of the risks and benefits of all their options is that patients are fairly split down the middle in terms of keeping the tooth or extracting it. Most people want to keep their teeth, but are torn as root canals leave bacteria behind. and leave it bacteria and infection free? Up to now the only solution I had to make sure that all the bacteria was removed was to extract the tooth and supply healing factors and co-factors to help speed the healing process and produce healthy bone. Please see my articles on PRF or platelet rich plasma. This sets up its own problem as the tooth usually needs to be replaced with a fixed bridge, removable partial denture or implant. 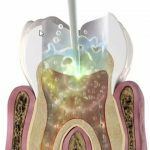 Now there is a laser technology that can directly address many of the problems inherent in root canal therapy. In the image to the left is a Nd:Yag and Erbium laser combination called the Lightwalker from Fotona. 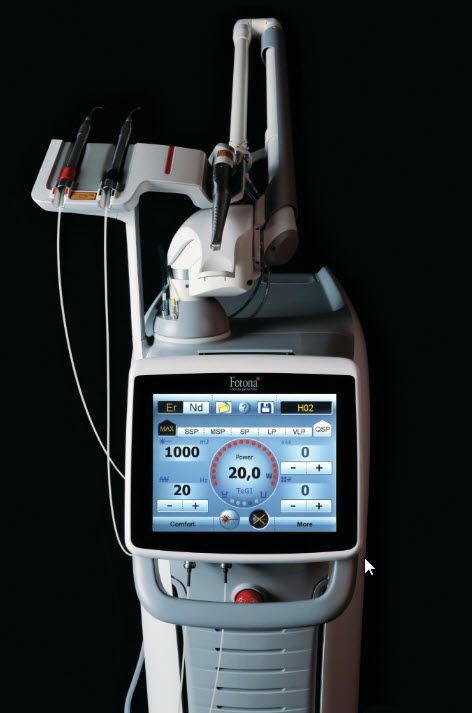 It is a breakthrough in laser technology because it combines the two most effective lasers in dentistry into one unit. I have had dentists tell me that they have had multiple lasers in the past and none of them do what this laser does. It is indeed a game changer and will allow us to do things in dentistry we haven’t been able to do in the past. 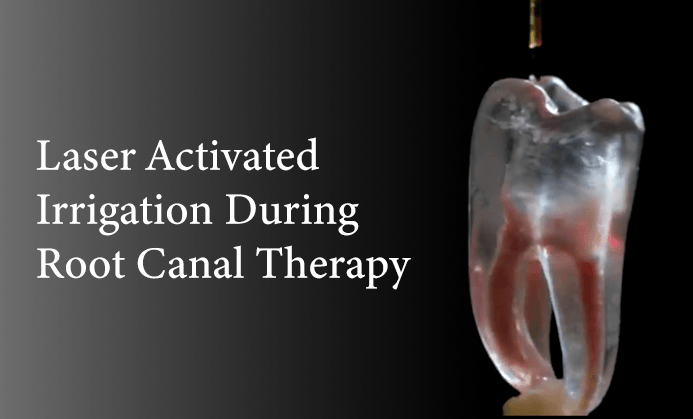 This video shows the effects of Photo-Accoustic Streaming in a slightly different mode or combination of pulses called SWEEPS on the lateral canals in the root canal system of a plastic molar tooth model. Do you see those horizontal channels/canals between the two vertical canals? Watch and see what happens when the laser is activated and super excites the solution: SWEEPS is like PIPS on steroids. How important is this in the treatment of Root Canals? Do you remember the video at the beginning of the post? If you watch it again, you will see that the files that are used can only access and clean the main canals of the tooth, which are vertical. As you can see in the videos just above using PIPS with the Fotona laser, now we can get to and kill all the bacteria that is trapped and hiding in the tubules of the roots and in all the lateral and accessory canals and communications between the main canals that cannot be reached or instrumented by traditional means. This is a game changer in dentistry. 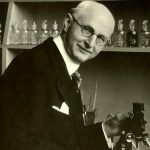 What happens to the bacteria in the tubules? PIPS also seems to work to great effect with bacteria in the tubules that were before now unreachable. In the picture to the left we see an electron microscope image of the tubules after root canal treatment using PIPS with just water. Just think how much more effective we can be with this technology in combination with an antibacterial rinse. 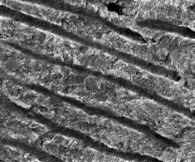 Now we can even get to the bacteria in the tubules. Is there a way to avoid bleach during root canals? Actually, there is. Ozone is now being used to good effect during root canal therapy. This is really good news as ozone breaks down to oxygen in he body and can be used to great effect when treating root canals. The reason ozone holds such promise in treating root canals is that is has been shown to be more effective at killing bacteria that even bleach, which is toxic to the body. I am hopeful that we will hear more about PIPS technology and the use of ozone as an alternative to the use of bleach in root canal therapy. Where can I get my root canal treated with the Fotona Laser & Ozone? The Fotona laser is such an upgrade and paradigm shift in dentistry that I have recently purchased one for my practice and am introducing it to my patients for those that want to address the bacterial infections associated with root canals and gum disease. Having viewed the video above and reading the information, it appears you still have to drill a hole into the tooth to access the root channels, is that correct? Once that is done, how do you insure that the hole that was drilled is not contaminated and is sealed properly? I am aware of the teeth/mouth being a source of bacteria and possibly the origin of systemic inflammation. As a chiropractor/nutritionist I’ve start using the SP/MH protocol for stealth pathogens of Artemisinin/Viranon/Myrrh and Echinacea. Do you think this will be able to eliminate those bacteria that are in the tubules? What is your thoughts on the effectiveness of oil pulling using coconut oil and oregano, or other oils like Frankincense, On Guard or Melaleuca on killing bacteria in the mouth and around the teeth ? Your input would be greatly appreciated. 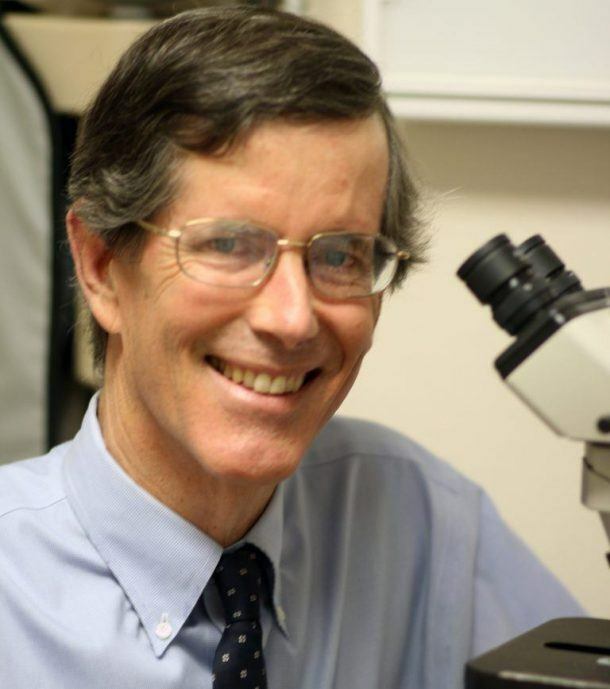 Hello Dr. McKinzie, thanks for your interest in the topic. Yes, these are very good questions and worth consideration. However, the problem with root canals is that there is no more blood supply into the tooth. The tooth is necrotic. Without blood supply, the body is unable to deliver immune cells or healing herbs like Myrrh, Echinacea, etc into the tooth. Therefore, bacteria in the body of the tooth and tubules of the roots survive. The oral rinses and oils you mentioned do help with balancing bacteria in the mouth for gum health but don’t do anything about the bacteria in the teeth and bone as they don’t penetrate that deep. I hope this helps. Feel free to write again if you have other questions. I have had three root canals in my life and have only recently become aware of the continuing post-procedure risks to my health. From what I have learned, it seems like the only prudent thing to do id to have those teeth removed, have all of the tissue removed to the bone and ozone gas used to clean out the tubules. 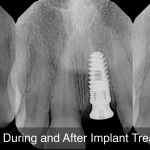 Then have implants using zirconia posts only to replace those teeth. Am I overreacting? Thank you! First, you should confirm that they are infected with a Cone Beam image. If you and your dentist decide they need to come out then definitely they can be replaced with zirconia implants. Speak to your dentist. You may have to find a dentist that specializes in zirconia implants as most dentists are not familiar with them. Good luck!